After the great success at the Automechanika trade fair in September in Frankfurt, TecAlliance GmbH will exhibit from 21 to 24 January 2015 at the AutoZum in Salzburg (Hall 01, Stand 106) for the first time. In summer 2013 the three leading automotive aftermarket providers in Europe – TecDoc Informations System GmbH, TecCom GmbH and AuDaCon AG under the TecRMI brand – merged to form TecAlliance GmbH. 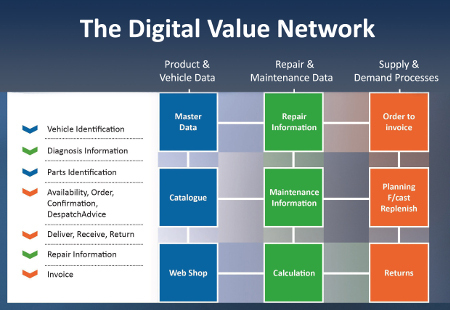 The company has gone the extra mile to underline its commitment to customers, by presenting new modules for repairing electronic components and expanding the TecDoc master data as well as introducing new filter criteria for vehicle searches, by incorporating the so-called Vehicle Identification Number (VIN). A recent study revealed that the specialist repair and maintenance company TecRMI was perceived to be setting the standard for workshop systems in the passenger car sector. “The synergies of our brand network, in which all three integrated pillars interact smoothly, allow us to offer a comprehensive industry solution that is gradually filling in the existing gaps in data for all vehicle sectors“, stresses Jürgen Buchert, CEO of TecAlliance GmbH. Boasting a total of two decades of experience, the TecAlliance brand network offers comprehensive electronic data covering passenger cars, trucks, and motorcycles as well as workshop equipment, workshop supplies, DIN standards and lubricants. 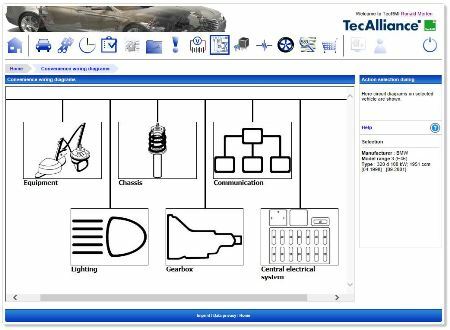 TecRMI, the specialist in repair and maintenance information and part of the TecAlliance GmbH group, supplies a graphical interface that not only clarifies the circuit diagrams of individual components, but also their installation positions, diagnostic values and the fuses and relays governing the power supply. This approach helps eliminate time-consuming vehicle searches. After localising the sensors or actuators, TecRMI also provides the corresponding diagnostic target and measurement values. The scope of this data includes measuring points, target values and testing preconditions. Instead of the standard illustration of the plug and its counterpart, the graphics reveal actual mapping and pin numbers of lines. This means you can test the electrical function of components faster and more accurately. 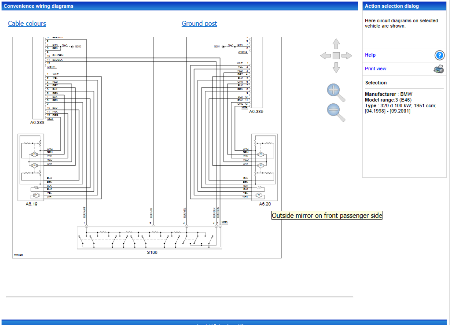 TecRMI also facilitates the search for installation sites and allocations for the ever-soaring number of in-vehicle fuse holders and relay carriers with a graphical overview of the vehicle. The new “Convenient Circuit Diagrams” module presented in Salzburg to further expand the range of information provided includes circuit diagrams for anti-theft devices, central locking, seat heating, airbag systems, lighting, combination instruments, window lifters, Hi-Fi, cruise control and immobilisers. The scope even extends to CAN-Bus systems and related networking. The new module available in January 2015 is compatible with all common European, Japanese and American vehicles built from 1992 onward. TecRMI offers competent system solutions for the vehicle and aftermarket industry, concept generators, service companies and vehicle fleet owners, the insurance industry and providers of credit and leasing services. TecRMI sets the standard for passenger car workshop systems. This is what a study by a consulting firm revealed after checking the levels of performance of six passenger car service providers. TecRMI performed with distinction, particularly in terms of the identification, quality and integration/intelligence of the repair data made available. Moreover, the figures also showed the repair data specialists within the TecAlliance GmbH group leading the way when it comes to the degree of performance for model repairs conducted under the study. In version 04/2014 of the TecDoc catalogue used to identify vehicles and their parts, TecDoc included motorcycles in the master data for the first time. The so-called general articles, in which TecDoc standardises the relevant spare parts based on type, will be gradually expanded. For two decades already, TecDoc has provided an electronic information system to facilitate parts identification in the passenger and commercial vehicle sectors, and will have achieved coverage of around 90 percent by the end of the year, including data covering the entire tractor sector. The rolling-out of the new product data standard for workshop equipment, tools and specialised tools started on a gradual basis from May 2014, details of which can be seen at the Automechanika trade fair (catalogue version 04/2014) in catalogues for the independent spare parts market. 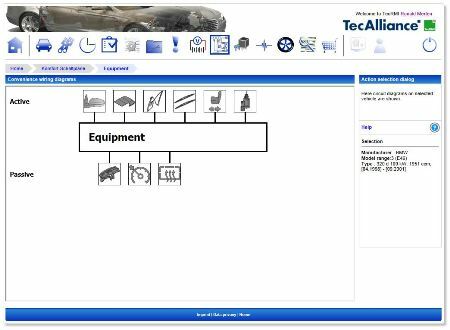 Standardised product information for workshop supplies, DIN and standard parts, factory equipment and occupational safety will follow from November 2014 and the scope of the TecDoc catalogue system will be expanded still further from April 2015 (catalogue version 02/2015). With effect from the 03/2014 version, integrating the TecRMI WebService 4.0 into the TecDoc WEB CATALOG allows customers to reap the benefits of the integrated passenger car and commercial vehicle VIN filter (Vehicle Identification Number) when examining new filter options as part of the vehicle search. This will be a huge help for all of the markets concerned, particularly commercial vehicles. Independent if the TecDoc WEB CATALOG, the new graphic search developed by TecRMI for information on spare parts and repairs provides a fast new way to fin the parts you need. For the TecRMI data user, the new services pave the way to implement this new search functionality within individual applications. This is all thanks to the filter technology developed by TecRMI, which provides only the product groups actually placed in the respective catalogue on request (general items). Visit TecAlliance at the AutoZum 2015, Hall 01, Stand 106, and find out more about the range of solutions. Whether for product and vehicle data, order and delivery processes. repair and maintenance information – with the integrated solutions from the three specialists TecDoc, TecCom and TecRMI a clear view of the spare part market is assured.